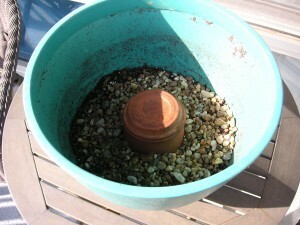 The biggest downfall of container gardening, especially if they get lots of sun, is keeping them wet but not drowning. 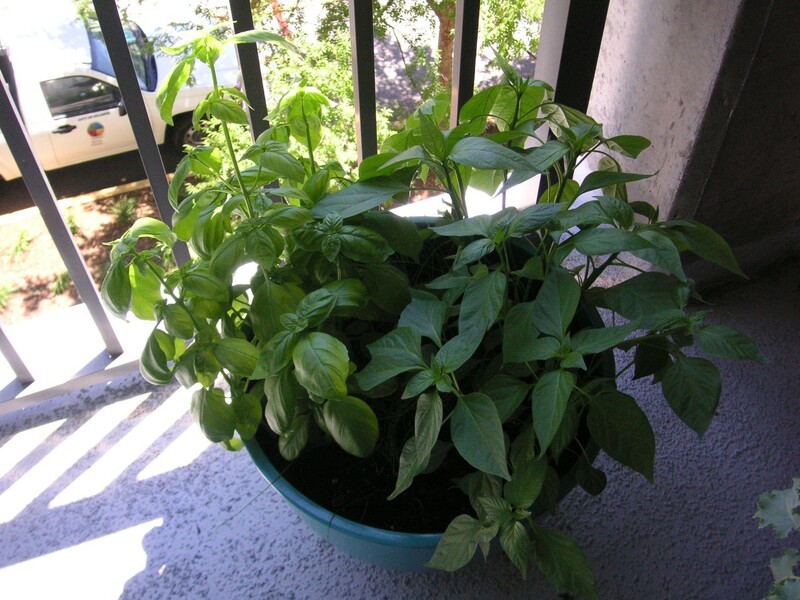 My balcony faces south so the sun not only grows lush plants but keeps me busy filling bottles of water. It’s easy to forget how much water the ground can hold. Even when it hasn’t rained for a week, there’s still more moisture in the soil than will be in a container after 1 hot day. Every drop of water these plants drink is carried by me. Container plants are always thirsty. I hate watering. Since I like to eat what these plants grow I still go through this almost daily ritual. Making containers with water reservoirs in the bottom are pretty straightforward. 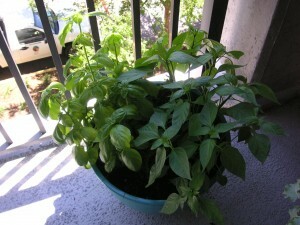 I’ve also experimented with nested containers and tiered containers to create larger self-watering pots. 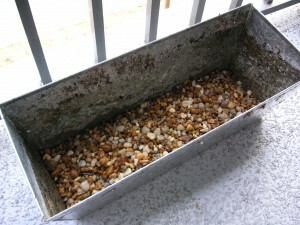 One of my attempts to make an easy, water storing container was to place a sponge underneath the dirt. As you can see, the roots got very thirsty and ended up completely devouring the sponge. I can’t remember, but I think I had some spinach or arugula growing here. 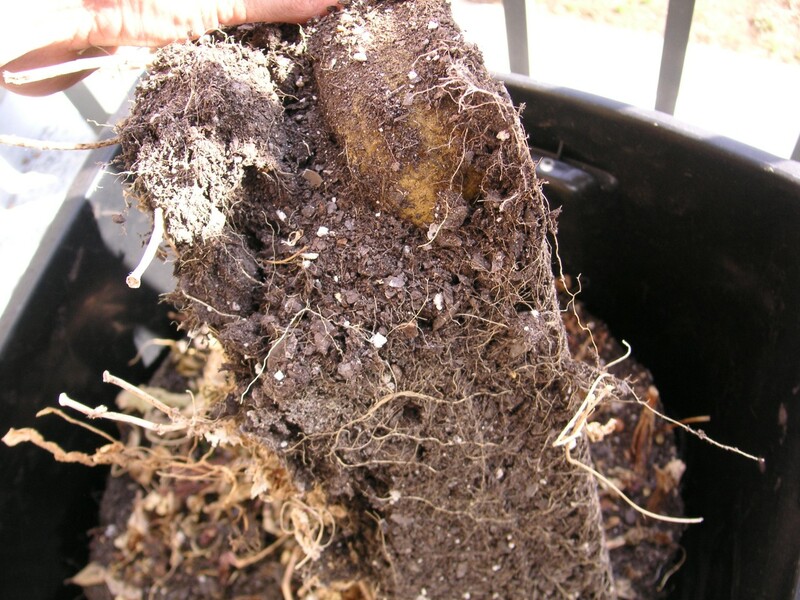 I also tried a variation of this but used 2 stacked containers: water in the bottom and soil/plants in the top. They were “connected” with 4 sponges pushed through holes I cut through the top container. I don’t have a good cross-section photo for it but you can get the idea. 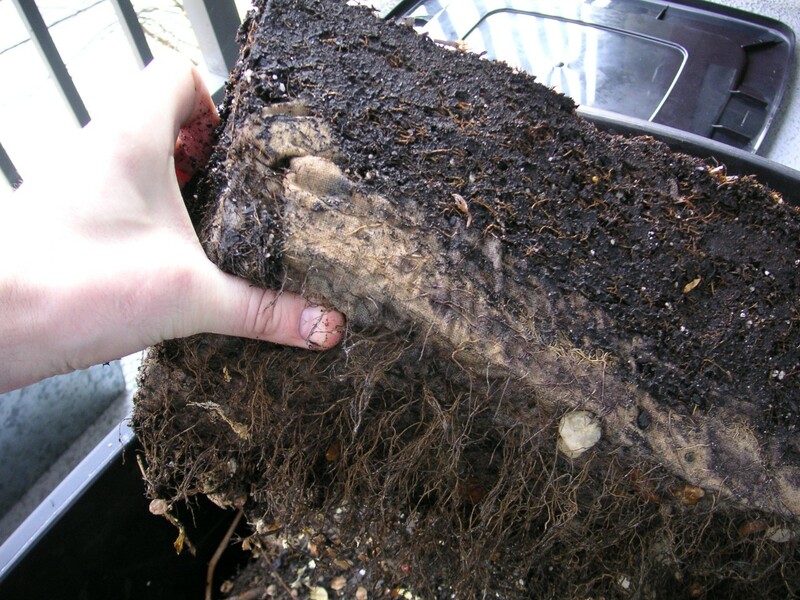 The window boxes worked pretty well using a rock drainage layer underneath the soil. These hung over the balcony and frequently flooded with rain so I had to drill a small hole about an inch below the soil line to keep water standing from on the surface (and molding over). You can really see the root penetration into the canvas I used to separate the soil from the rock layer. Finally, my favorite container involved an inverted terra cotta pot surrounded by a rock layer for drainage and stability. Regardless, I think my next project will involve creating a centralized water bucket and have it feed the containers through a series of tubes and piping. Think mini water tower. I’ll start on that when the watering can gets too heavy. 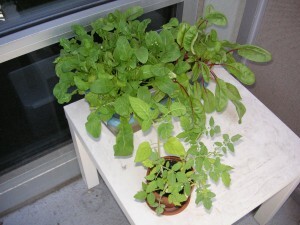 You are currently browsing the archives for the Urban Gardening category.